For the second year in a row, I have won the timetable lottery! I teach three classes this semester, a full load, but my teaching responsibilities are such that I finish my classes before lunch every Friday. This has created a wonderful opportunity for me to travel. In September, I only arranged day trips at the end of the week, but by early October, I was on my way to Paris for the weekend with my husband, who had joined me in Switzerland a few days beforehand. 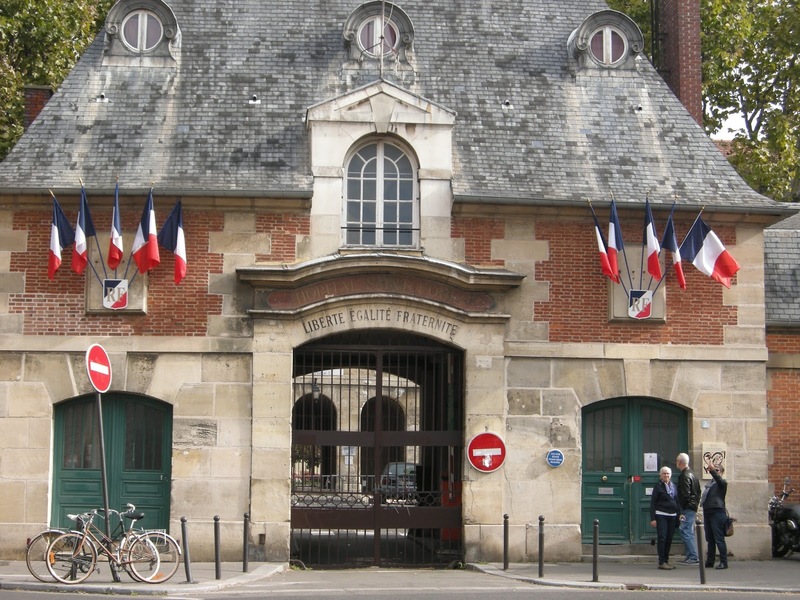 The train trip to Paris is between four and five hours, depending on the route. I love train travel! My life over here is often so very busy that I welcome the opportunity to relax as the train speeds to its destination. 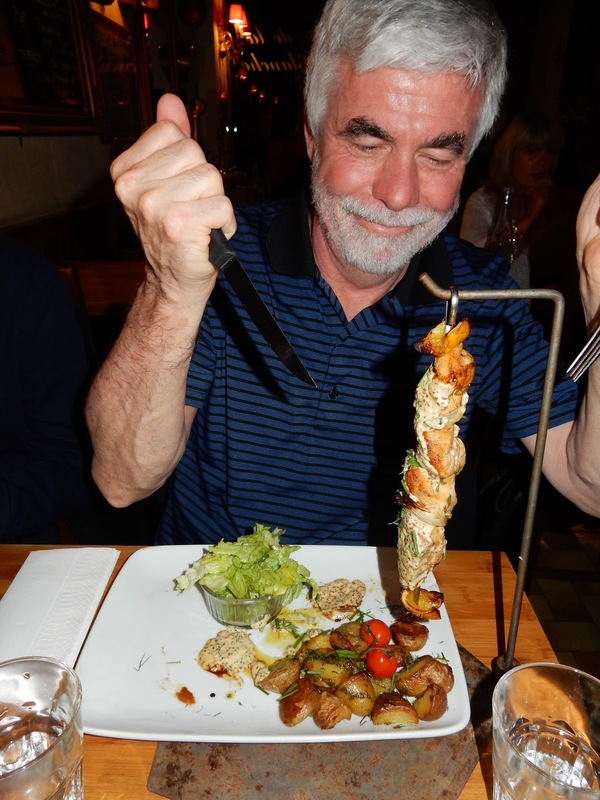 I always aim to get a lot done on the train too, so that there is more time to enjoy the places I visit..
We dined on Friday evening at this restaurant recommended by my daughters. 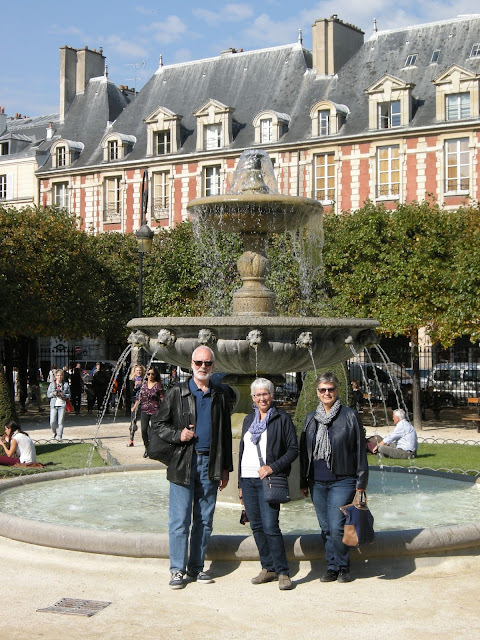 Our time in Paris was extra special since we spent it with old friends, Janet and Tom, who have a studio apartment in the city. We had chosen a hotel in their district, the Marais, so we were only a short walk away. On Friday evening, we walked to Ile Saint Louis for dinner at l'Auberge de la Reine Blanche. This small restaurant had been highly recommended by my daughters, Katie and Jess, who had eaten there in April. We all agreed that the food was very good. 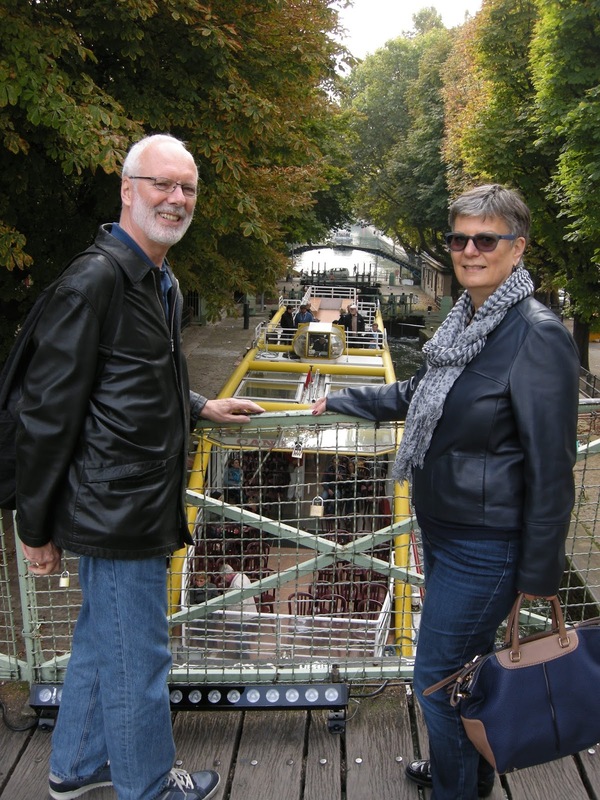 Tom and Janet at the canal Saint Martin. Tour boats were going through the locks. The following day was very busy. 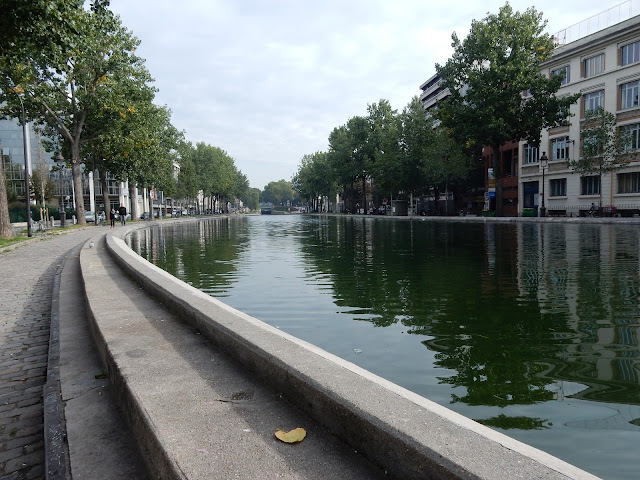 Since Bob and I had visited Paris quite recently – in May – we chose to explore new areas of the city, ones that most tourists would not see: the canal district in the 10th arrondissement, and the multicultural nighbourhood nearby called Belleville. 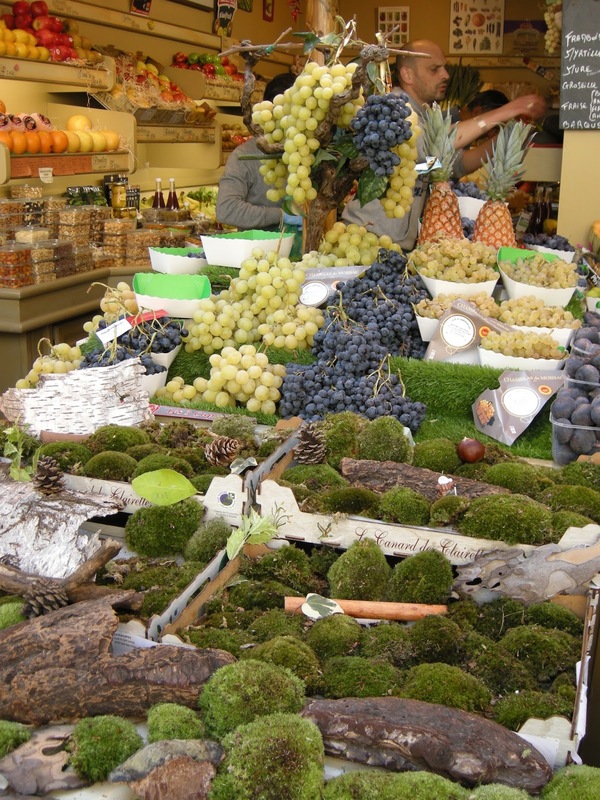 Produce at le Marché des Enfants Rouges. 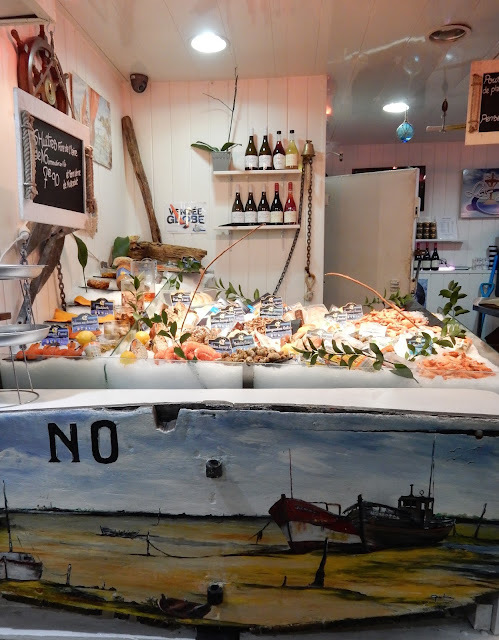 This was also a day to visit markets, first the one near the Gare du Nord, Marché Saint Quentin, and later, for lunch, a bustling place called le Marché des Enfants Rouges, where sellers of fresh produce and fish competed for business with small restaurants on the site. It seemed that all of Paris had joined us at this market that day. 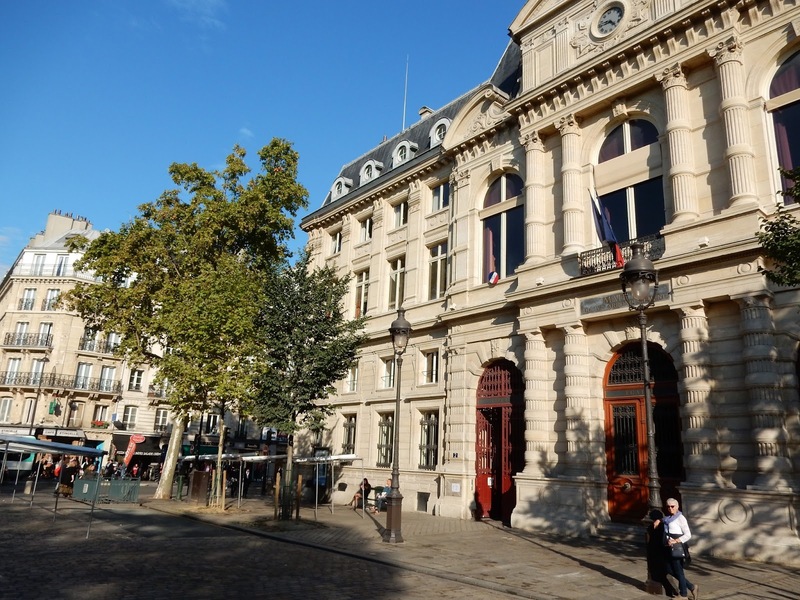 During our long stroll, we also visited Place de la République. 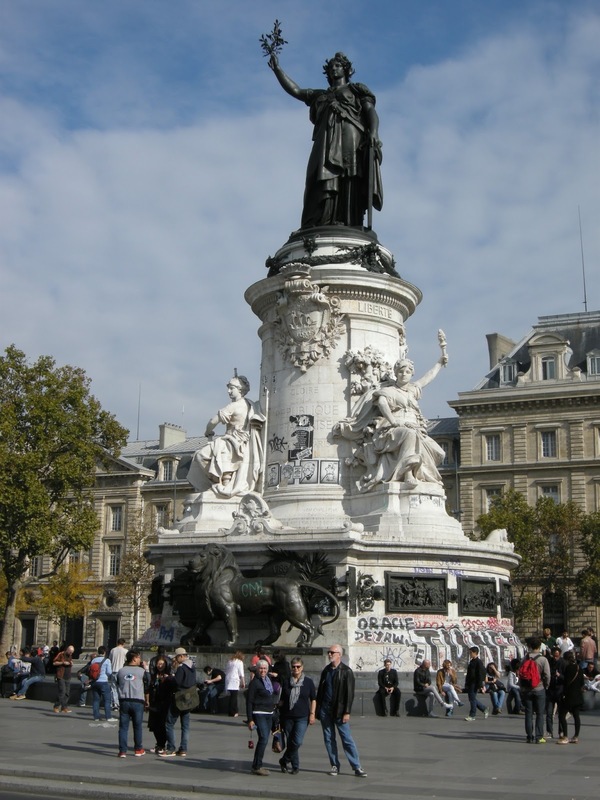 In my four visits to the City of Light, I cannot recall visiting this important square, with its impressive monument in the centre. When Parisians hold a demonstration or a rally, this is the likely place. 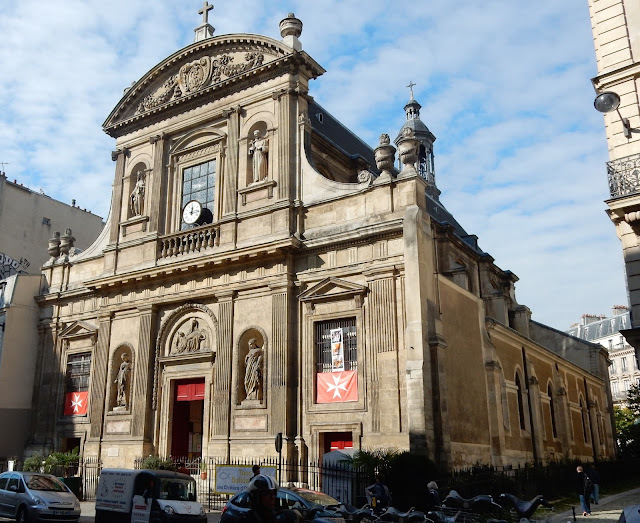 We came upon two churches as we rambled, and, of course, we went inside to look around. The first, l'Eglise Saint-Laurent, was a gothic gem, while the other one, Saint Elizabeth of Hungary, dates from the early 17th Century. It was the more colourful of the two churches, and the better maintained. Enjoying the WiFi at Café Français. Bob is in the mirror. Eventually, we found ourselves in familiar territory: my favourite Parisian square, la Place de Vosges, in the Marais district. 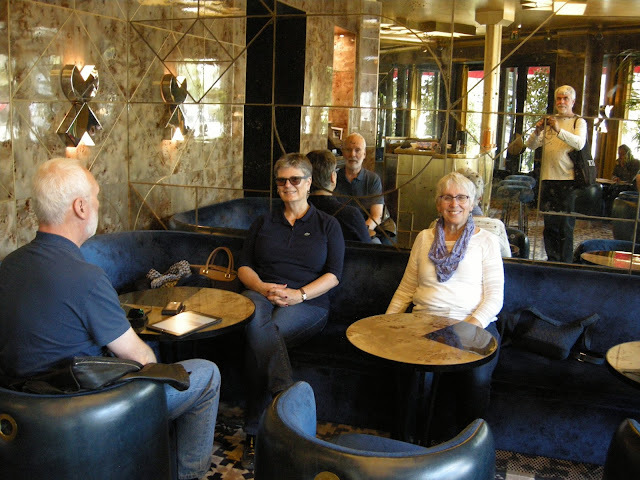 After a coffee break at the Café Français in the Bastille area nearby, we took our leave from Janet and Tom for a few hours. While Bob and I considered resting, we decided against this plan. 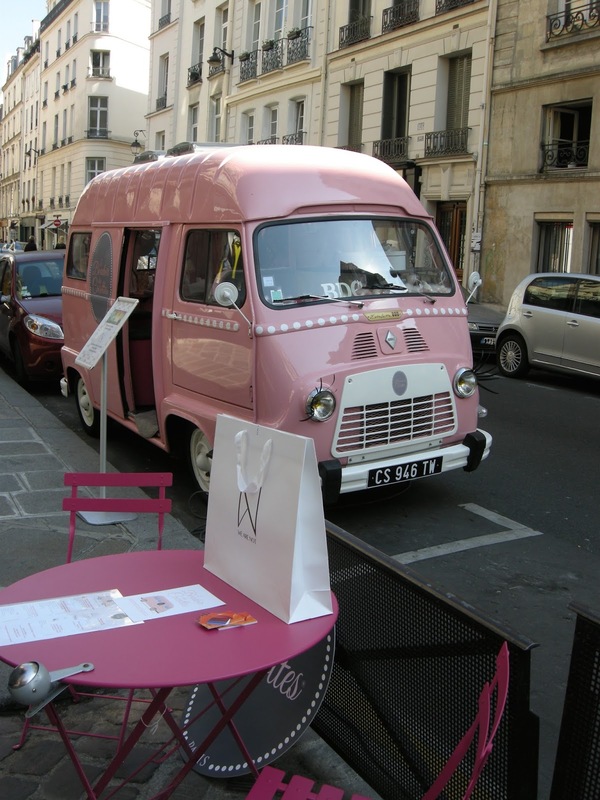 The day was just too lovely to stop wandering the streets of Paris. We own a painting of this bridge, so we had to find it. 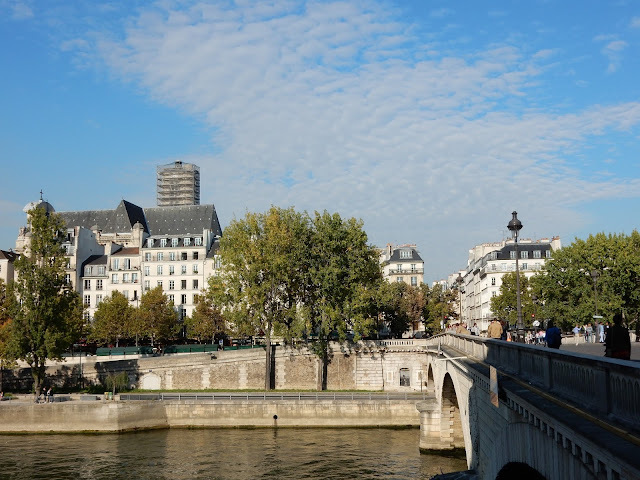 We made our way toward the Seine, and then back to our hotel, thinking all the while how beautiful this city is, and how much we love it. We could have wandered all day! A pretty corner of the Marais District. 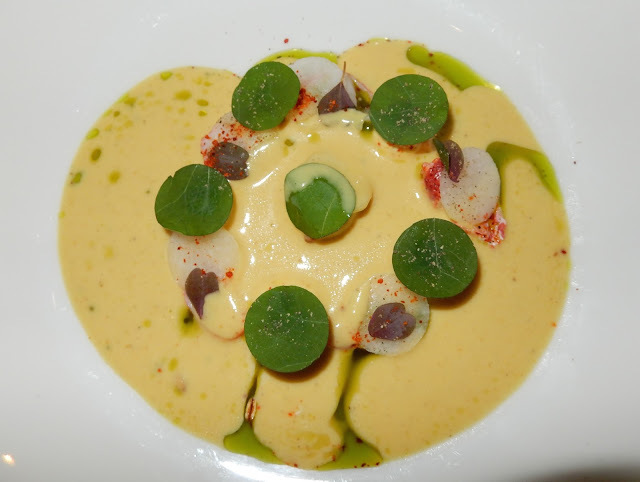 Dinner that evening was at La Pirouette, a modern restaurant near the Georges Pompidou art gallery. Janet and Tom had met the chef there during the summer and thought very highly of him, so she had reserved us a table. We were not at all disappointed. This was a delectable three course meal. 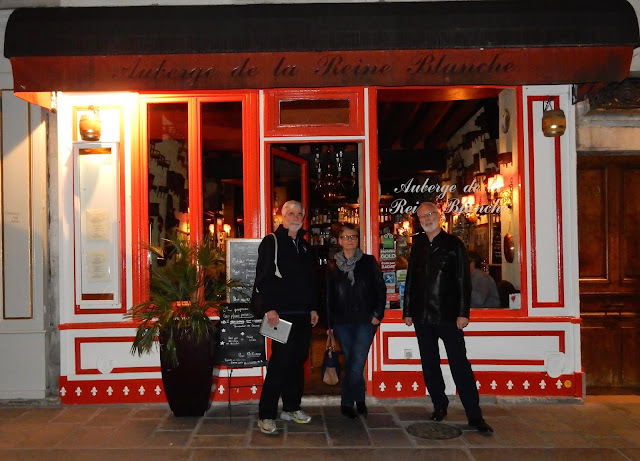 As we walked to and from the restaurant, the streets were abuzz. 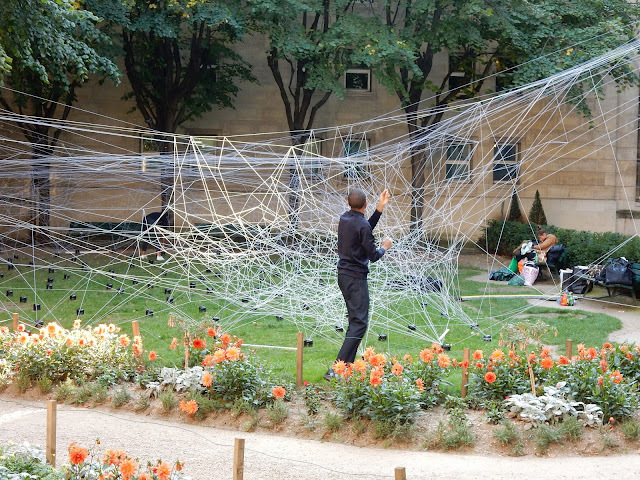 This was Nuit Blanche in Paris. Creative art installations appeared in various buildings and squares. We had previously noticed (through a storefront window) a fellow painting shoes. 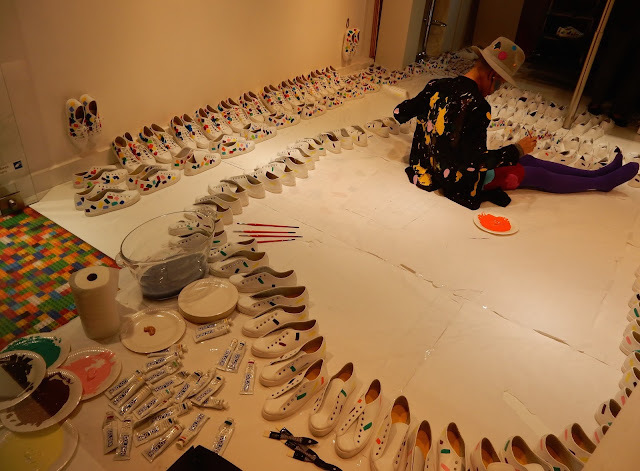 I suppose that was part of the same event – live art – , but it could also have been tied in to Fashion Week which began the next day. 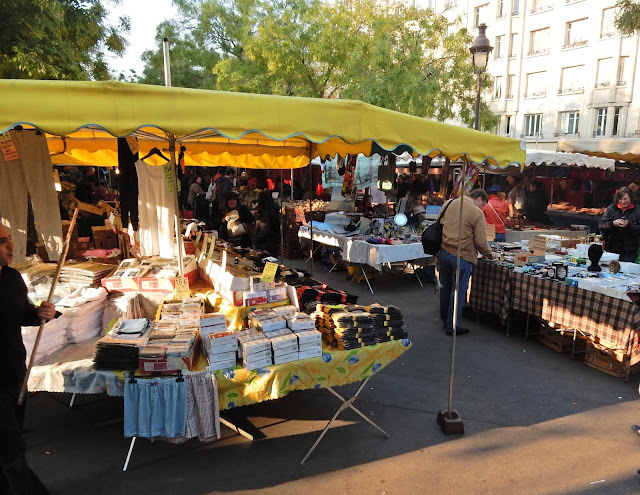 On Sunday morning, we met at the market close to our hotel before heading to the Metro to travel to the 16th arrondissement. This lovely part of Paris was new to us. The streets are wide and there is parkland nearby. 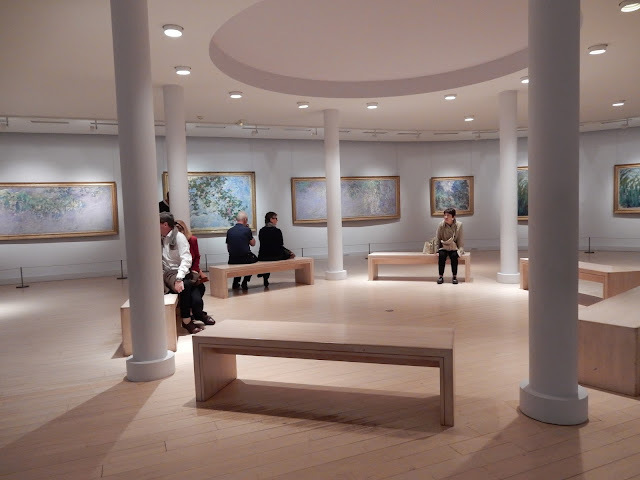 Our destination was the Marmottan Monet Museum, which houses an extensive collection of the Impressionist's works. Fittingly, there was a temporary exhibition of Swiss art work on this day too. We thoroughly enjoyed our time there. On the way back to our district, we stopped for a final lunch at Maison Plisson with Janet and Tom before saying our goodbyes. 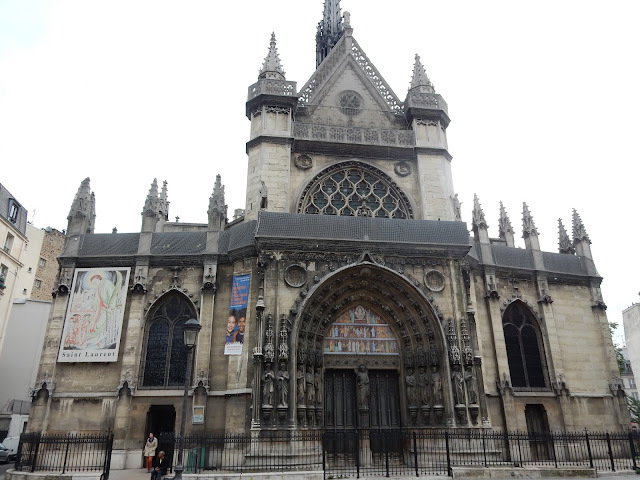 They would head back to Canterbury that evening, while we returned to Neuchâtel. 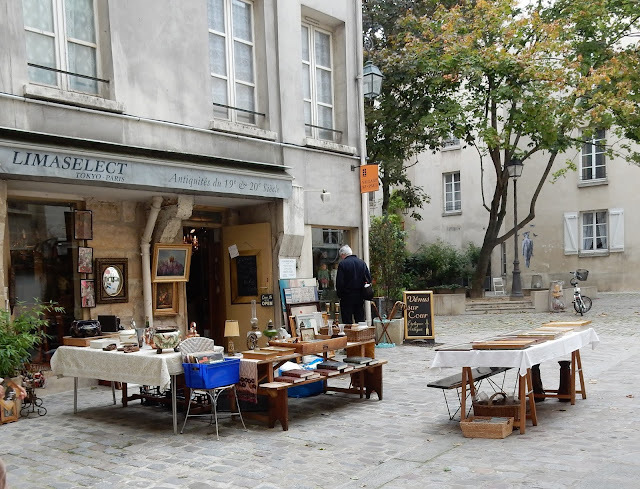 Before that, there was still some time to shop, something very rare in my corner of Europe on a Sunday, but the stores were open in the Marais, yet another reason to love the area. Bob shopped the antique stores in the Saint Paul area. 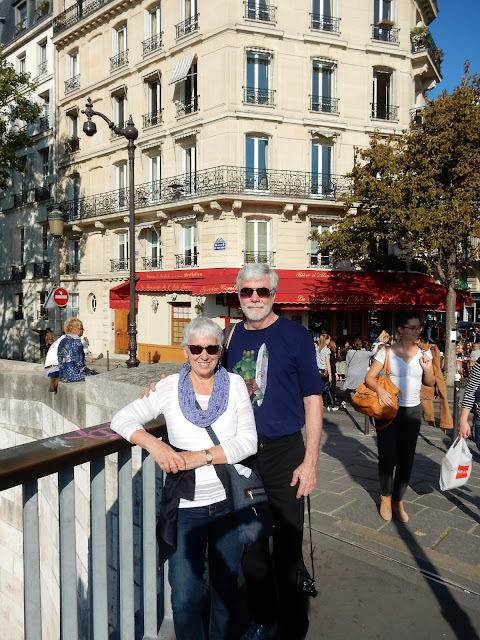 All weekend, Paris put on a beautiful face for us, and we enjoyed a combination of familiar and novel sights, all made even more memorable since we were able to share them with friends. Thanks for joining us, Janet and Tom.